One of my favorite people came to see the work I did at Cat’Art this morning. She said she’d been saving a place for one of my works…and she chose one of my favorites from the trip…Cat’Art 11. ……..and with all the work in her collection, she didn’t have any collage. It’s somehow reassuring to find that the one you gravitate to most is also the one such a knowledgeable person also likes enough to buy. I’m doing a little experimenting with using the Microsoft Photo Story 3 program. 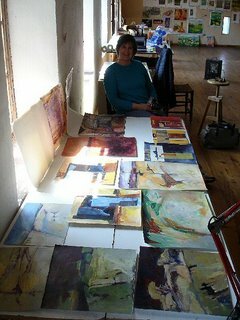 I uploaded some pictures of the day we all set up our work informally and talked about what we did during the month at Cat’Art. I didn’t have a picture of myself (unfortunately, ha-ha) since I took these pictures. Just click on this expo link to download my video. And please don’t laugh at my Texas accent. It will take some downloading so be patient even with broadband. Also, MAC users may not be able to bring it up in their version of Windows Media Player. I hope to remedy this problem later, if possible. I just adlibbed this commentary so I’m sure some of it leaves something to be desired. As far as my work, I did quite a few small collages and paintings, but am most looking forward to seeing what will happen with my work in the future from all the time we were exposed to these new experiences and a different environment. …………….thanks to Karen Jacobs for this picture of me and my work……….